Your own two feet, that is. Our feet are our loyal servants. They obey our every command, from a quick walk to the store to running a marathon. But when they complain, we really need to listen. 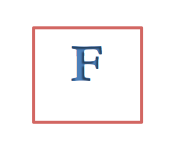 F also stands for footfall. On your next run, leave the earbuds at home and try to listen to the sound of your feet as they touch the ground. Does one foot sound louder than the other? If so, you could be landing harder on the louder foot. This uneven stride can lead to foot pain as well as back pain and even potential injuries. Why not mix things up a bit? Instead of a constant one-two, one-two, try different rhythms. Count to three or even to five as your run, as long as you make sure you don’t always emphasize the same foot. Treat your feet with kindness and equality—they’ll thank you for it. F can stand for a lot of other things: freedom, fun, food (a favorite word with runners!). I’m sure you have your own ideas.